Shannon D. Williams, a full-time Instructor in the School of Justice Studies, completed all requirements for a Ph.D. in Sociology at the University of Tennessee. His dissertation, titled, “A Contribution to the Critique of Labor Share Analyses,” followed up on his earlier research published in the prestigious Cambridge Journal of Economics (2015). 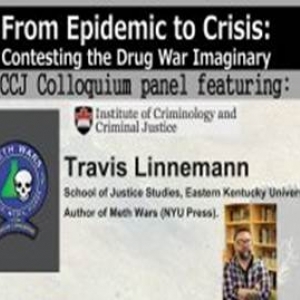 Dr. Travis Linnemann was recently invited by the Institute of Criminology and Criminal Justice at Carleton University (Ottawa, Ca) to give a talk on his recently published book, Meth Wars and participate in a colloquium on Ottawa’s ongoing problems with opioids.